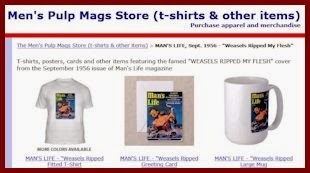 Earlier this year, when we published the WEASELS RIPPED MY FLESH! 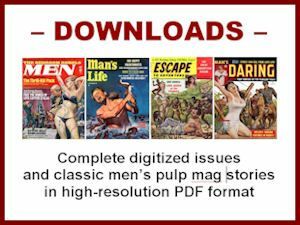 anthology of men’s adventure magazine stories, my multitalented co-editor Wyatt Doyle also launched the WEASELS RIPPED MY FLESH! Facebook page. 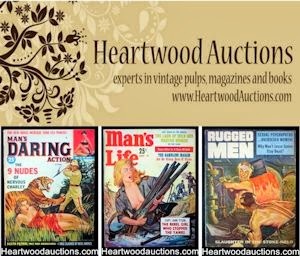 Wyatt and I both do regular posts there, as well as in the Men’s Adventure Magazines Facebook group, which I created a few years ago as an offshoot of this blog. Since I haven’t said much about the WEASELS FB page here, you may not have seen that one yet. One of the recent posts on the WEASELS FB page was a shot of the cool cover Wyatt designed for our next book: HE-MEN, BAG MEN & NYMPHOS, an authorized collection of classic men’s adventure stories by the great Walter Kaylin. Before Mario Puzo became famous as the author of THE GODFATHER, he and Walter both worked as staff writers for Magazine Management, one of the top publishers of men’s adventure magazines in the 1950s, 1960s and early 1970s. Puzo considered Walter to be one of the best of all men’s adventure magazine writers. We wholeheartedly agree with Mario and are very happy to say that in the near future Walter Kaylin will be back. The official publication date for HE-MEN, BAG MEN & NYMPHOS will be announced soon on the WEASELS Facebook page and on Wyatt’s New Texture site, home of the books published under the banner of his pioneering indie publishing company. As the title suggests, “SURF PACK ASSASSINS” is a wild tale, and it features some equally wild illustrations by artist Earl Norem, one of which I posted on the WEASELS FB page last week. During most weeks, I usually post a variety of images from men’s pulp adventure magazines there, including cover scans, interior spreads and examples of some of the often funny advertisements from vintage men’s adventure mags. One of the covers I recently posted was the May 1959 issue of MAN’S LIFE. It sports one of the great, gonzo animal attack cover paintings created by artist Wilbur “Wil” Hulsey (sometimes credited as Will Hulsey). Of course, Hulsey also did the painting for the famed “WEASELS RIPPED MY FLESH!” story — which, obviously, is one of our favorites. 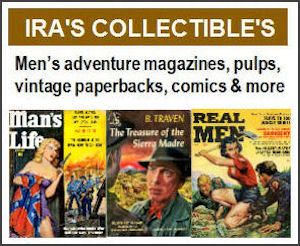 If you’re a fan of men’s adventure magazines, you probably know that many famous writers once wrote stories for men’s pulp adventure magazines early in their careers. One example I mentioned recently in the WEASELS Facebook group came from the June 1967 issue of FOR MEN ONLY. In fact, that’s a pseudonym used by Martin Cruz Smith back when he wrote stories for men’s adventure mags in the ‘60s and early ‘70s, before he hit the big time with his 1981 novel GORKY PARK. We’re hoping to get permission to reprint some of Martin’s old men’s pulp mag stories in a future volume of the WEASELS RIPPED MY FLESH! anthology series. Another recent post on the WEASELS FB page featured a story about another category of wackos, the “TEEN TERRORS OF THE TAMIAMI TRAIL,” from the January 1962 issue of MAN’S DARING. If you want to know more about those juvie fiends, you can download a complete, high-resolution PDF copy of that issue in the MensPulpMags.com virtual newsstand. When I posted the cover of the January 1963 issue of RAGE magazine on the WEASELS FB page, I noted that the “WHIP-MAD SHEIK” depicted in the uncredited cover painting looked evil, nasty, short and ugly — but he did have good taste in distressed damsels. I responded by showing the illustration for that story, which suggests that it might have been bad if the Madame who ran that establishment was mad at him. She looks more whip crazy than the sheik. Since I still have a day job, I’m always happy when Friday rolls around. Last Friday I posted a scan of the cover of MEN, July 1956, with the comment “Phew! Made it!...To the weekend, that is.” The painting of the shipwreck survivor on that cover was done by artist John Kuller. I also posted a link to a great interior illustration that had been posted in the Men’s Adventure Magazines FB group by illustration art collector David O’Dell. That painting, by the great Bruce Minney, was used for a story titled “THE HAPPY PRISONER ON WONDERFUL BRIDE ISLAND” in the July 1961 issue of FOR MEN ONLY. Bruce passed away not long ago. On August 20, we heard the sad news that Elmore Leonard had also died. Though he’s best known for his novels, Leonard wrote many short stories for magazines, including several that were published in men’s pulp adventure mags. 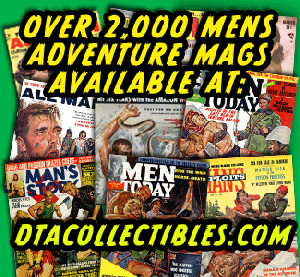 One was “THE TREASURE OF MUNGO’S LANDING.” It originally appeared in the June 1958 issue of TRUE ADVENTURES magazine. On the day Leonard died we posted a scan of that cover of that issue on the WEASELS FB page. I have yet to track down a copy of that issue for my collection, but I have read the story. It’s included in the paperback edition of THE COMPLETE WESTERN STORIES OF ELMORE LEONARD (which I highly recommend). Around the same time, I posted a scan of the interior spread for the gruesome killer ant story “I WAS EATEN DOWN TO THE BONE.” As noted in some comments about the post, that story is reminiscent of the classic adventure story “LEININGEN VERSUS THE ANTS,” which was adapted for radio in 1948 and 1957, and served as the basis for the 1954 Charlton Heston movie THE NAKED JUNGLE. Another recent post on the WEASELS FB page showed an interesting example of artistic recycling. When I saw the cover of MAN’S LIFE, March 1961, the poor damsel in distress seemed familiar. Eventually, I realized she was the same hapless victim of another group of skull-happy natives featured in a scene on the cover of the September 1960 of MAN’S LIFE. Both cover paintings were done by Earl Norem. And, while watching the latest Discovery Channel’s “Shark Week” episodes this year, I was inspired to post a shot of one of my favorite shark attack covers, the June 1953 issue of AMERICAN MANHOOD magazine. The cover painting on that one was done by artist Peter Poulton, who I discussed in a post here a while back. or on the WEASELS RIPPED MY FLESH! Facebook page.